For Americans, it was a discrete conflict lasting from 1950 to 1953. But for the Asian world the Korean War was a generations-long struggle that still haunts contemporary events. With access to new evidence and secret materials from both here and abroad, including an archive of captured North Korean documents, Bruce Cumings reveals the war as it was actually fought. He describes its origin as a civil war, preordained long before the first shots were fired in June 1950 by lingering fury over Japan’s occupation of Korea from 1910 to 1945. 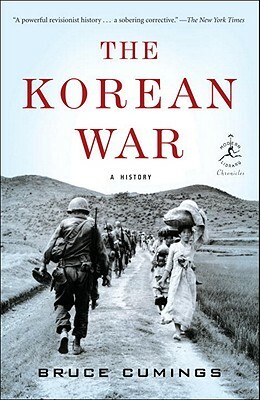 Cumings then shares the neglected history of America’s post–World War II occupation of Korea, reveals untold stories of bloody insurgencies and rebellions, and tells of the United States officially entering the action on the side of the South, exposing as never before the appalling massacres and atrocities committed on all sides. Elegantly written and blisteringly honest, The Korean War is, like the war it illuminates, brief, devastating, and essential. Bruce Cumings is the Gustavus F. and Ann M. Swift Distinguished Service Professor and chair of the Department of History at the University of Chicago, and specializes in modern Korean history and East Asian–American relations.